Once we've displayed our to-do list, we need to be able to mark our to-do items as completed. 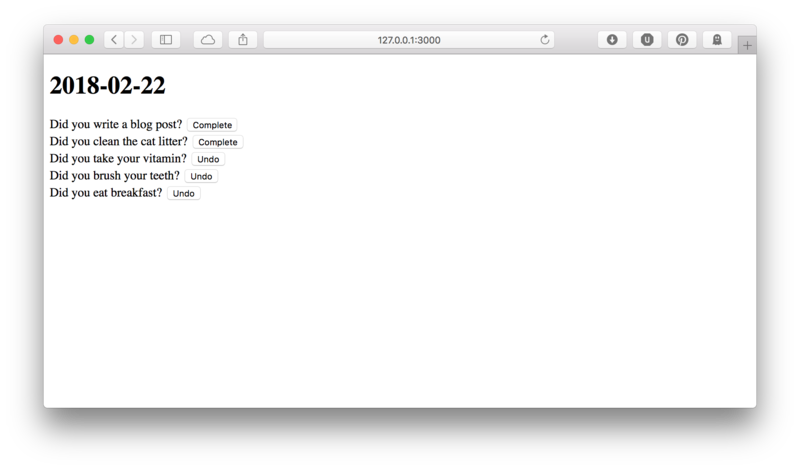 We will turn each of our todo log entries into a form with a button. Clicking on the button will mark the item as completed, or, if it's already completed, will mark it as incomplete (in case we mistakenly complete something we haven't done). First, we should build a route to mark an entry as completed. This will be a POST request, so we use the post function. We're going to put the ID of the log entry in the URL to make it REST-like. The : in the route path introduces a placeholder. The text following the : is where Mojolicious will save the value in the stash, which is a general storage area for the current request. So, we can get the ID out using the stash() method of the controller object. Our form will have a button that will have a value of true (1) or false (0) if we are marking the item as complete or incomplete. Form values are retrieved by using the param() method of the controller object. If the item is complete, we want to store the date that the item was completed. Otherwise we want to set the completed date to null (from the Perl side, we use undef). Then we can execute a SQL UPDATE query to update our log entry. Finally, we redirect the user back to where they were, our index page, with the redirect_to() method, which takes the name of the route to redirect to as an argument. This route needs a name, so we'll give it a name of update_log. We're going to use this name to build a form that gets submitted to the right URL. Down in our template, rather than displaying an unordered list, now we're going to render a form for every item in the list. This uses the form_for helper. Helper functions are also available in every template (making them truly helpful). The form_for helper is part of a set of helpers installed by default from the Mojolicious::Plugin::TagHelpers module. It takes the name of a route, a hash reference of placeholder values (in this case, we need to give it the ID of the log entry), and then we use the begin function. The begin function allows us to add a template as an argument to a function. The end function marks the end of the content, and then the whole thing is given to the original function (in this case, form_for). In this way, the form_for function will wrap our content in <form> HTML tags. Inside our form we print out the text of the todo item. Finally, we add the button. If the item is not completed, we'll make a button that marks the item as complete. If the item is completed, we'll make a button that marks the item as incomplete. Now we can see our button and click on it to complete our to-do list!